Empower our Students: Save City College! Rm: 104-A Multi Culture Resource Ctr. Each One Teach One is an officially recognized program of the Associated Student’s Council. “Persons requiring disability-related accommodations for this event should contact Disabled Students Programs and Services at (415) 452-5481. Please allow for 72 hours advance notice. This event was made possible by your $5 Student Activities Fee. Hey all! 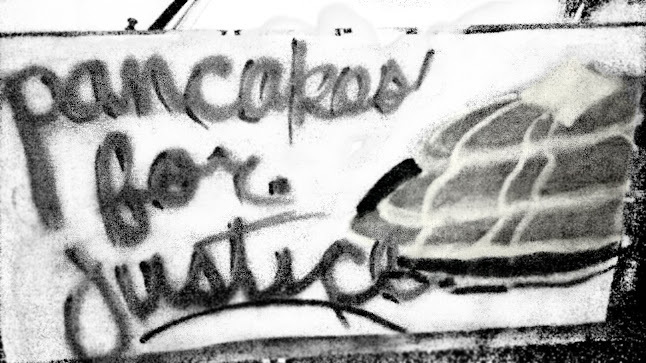 Pancakes for Justice is back! At cost, vegan pancakes. 25¢ each. All in the name of community. Continuing weekly throughout the semester. 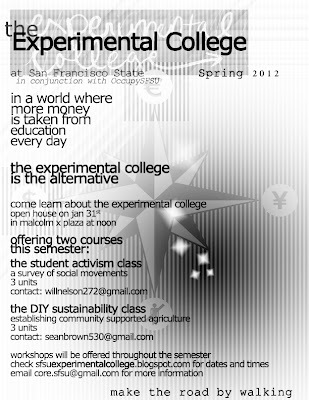 School is back in session for the Fall 2012 semester and so is the Experimental College at SFSU. There are two courses being offered that are facilitated by your peers! Check out the "courses" tab to see what's in store! at In the Works Collective Space at 3265 17th St. This conference aims to bring together students and activists from across the Bay Area for a symposium on organizing and maintaining movements. If YOU would like to put on a workshop, send us a message! There's still time to pencil you in! WHAT: The Bay Area Student/Activist Conference! 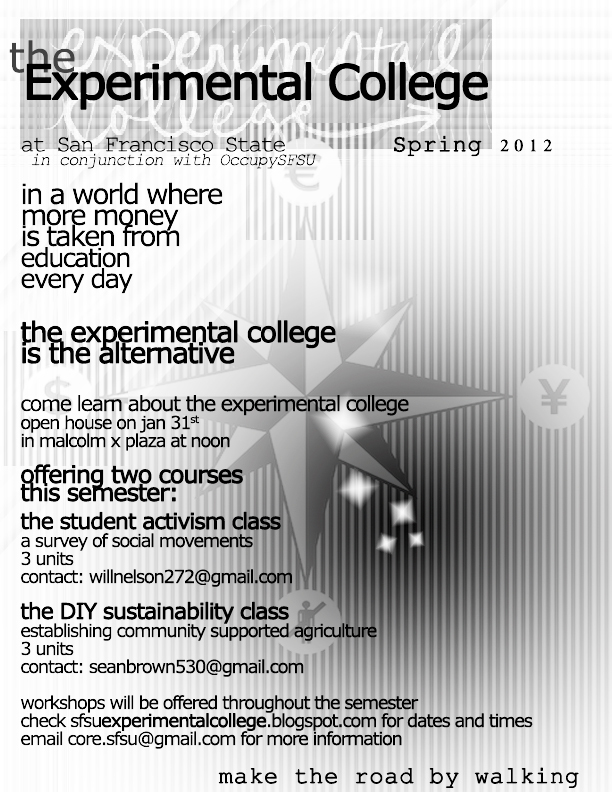 WHO: Students, activists, and student-activists all over the Bay (and beyond)! WHEN: Sunday, May 6th from 10pm-6pm (or later)! WHERE: In the Works Collective, 3265 17th St! Well, we made it into the school news paper. Besides some attention and good quotes from supporters and organizers: “We’re not getting the education that we deserve, so we’re making it happen for ourselves”(Henry),a lot of content was edited out. The article also misses the bigger point on how the administration should be supporting folks who are engaged in their education, by interviewing a dean who has never worked with ec'ers. What do you think of the article? You can summit opinions on their website. The Student Activism Class held it's first meeting yesterday. Here is everything you need to know if you want to attend next Wednesday, February 8th. Here is a link to the SFSU independent study form if you're looking to take the course for credit. 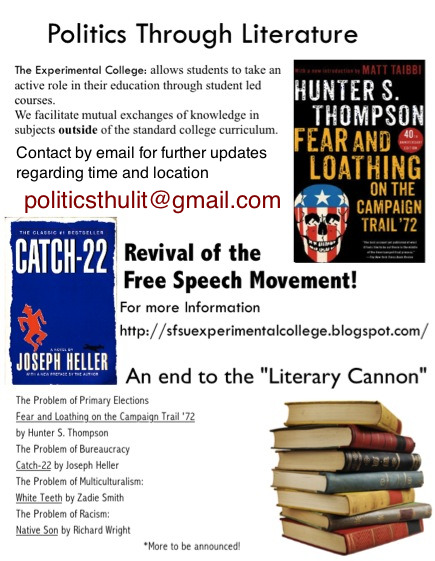 email duckshirt@gmail.com for a syllabus. Over the past few semesters, we've seen classes disappear and class sizes increase beyond capacity. This is a problem that plagues both students and teachers, but we believe we have an alternative. The experimental college at SFSU allows groups of students to effectively teach themselves and each other curriculum for credit towards graduation. The college is designed to provide learning opportunities to fill in the gaps in the heavily stripped course catalog, as well as to provide aide to students who need access to classes that are usually impacted. Currently, the experimental college is still setting up the infrastructure necessary to meet all its goals. This semester, we will focus on providing students with workshops to acclimate them to the idea of a self education. In the fall semester, we hope to provide a wide array of upper division and GE classes for students who were unable (or unwilling) to register for regular university courses. We are, however, offering at least one course students can take for credit during the Spring '12 semester. The class will be a tour of social movements designed to push its students to critique their surroundings and promote activism. 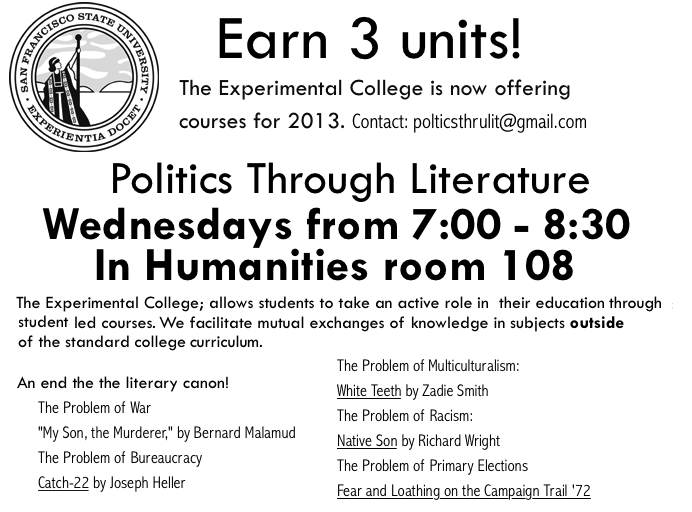 It is being offered through the political science department, sponsored by Kathy Emery and James Martel. Up to three units will be available for the class. THE CLASS: Students will research and discuss social movements and the historical and social conditions that led to their necessity. Examples include the Southern Freedom movement, the Black Panther Party for Self-Defense, Students for a Democratic Society and the Weather Underground, and the Earth Liberation Front. We will analyze the effectiveness of the movements using our established "11 Key Components for Effective Social Movements". Students taking the class for credit will be responsible for leading at least one class discussion, either alone or in a group. Grades will established by the students themselves on an honor system. Failing grades will only be given to students who registered but did not present, or to those who stopped attending/participating, with few exceptions. The first few weeks will be led by Will and I as a means of demonstration, then the reins of the class will be passed to its attendees. We will strive for a democratic environment. Our goals will be to heighten awareness and embody consciousness through research and experience. Students: If you are interested in taking the class, or, if you would like to know how to offer your own class or workshop, reply to this email and information will be given. Faculty/Lecturers: If you have students in excess on your first day of classes, we ask that you let them know about this alternative. It is important that the experimental college succeed so that students and teachers alike be alleviated of the burdens placed on them by the administration, cuts from the capital, and the overwhelming influence corporations have over public institutions of learning. We feel that, with your support, the success of the college will be inevitable. Thank you for taking the time to consider our proposal. Feel free to contact us if you have any questions OR if you would like to meet with us to chat. 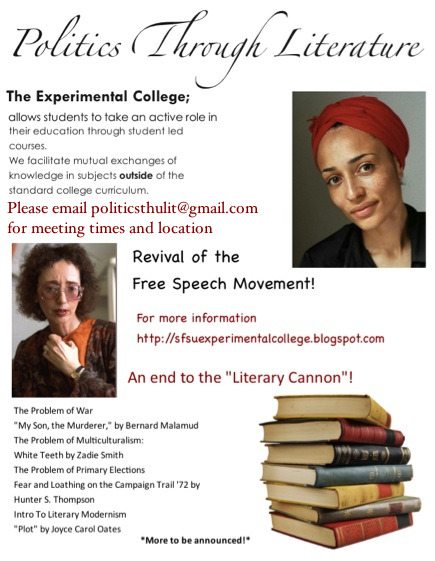 These are some thoughts regarding how to organize an experimental college class based off my experiences as an organizer last year during the second phase of the contemporary experimental college. Formulate a class with a group of people interested in organizing around a similar focus and start preparing a syllabus. For our experimental college class of the Horizontal Resistance Movements we had a vague idea of studying horizontalism within different social movements. We found folks that had taught similar classes while completing graduate work at UC Santa Cruz. They sent us their syllabus and we added more material to the class. Outreach, Outreach, Outreach. Begin to outreach for potential students that might enroll in the class. This is perhaps one of the most important things that you will need to do in order to organize towards a successful class. You can’t really have a class without any students to participate. Find creative ways to engage students in the formulation of the class. Ask that they approve the syllabus the first day, ask students to add to the syllabus and help create the class, break down the barrier between student/teacher and make every student a teacher and every teacher a student. Determine whether you want to take the class for credits. If you do then you will have to learn how to navigate through the bureaucratic structures that exist within the school. Perhaps, the most successful strategy if you do decide to lean towards accreditation for the class is to find a sympathetic chair of a department that will sponsor the class. Once they decide to sponsor the class then you can register the class in what is commonly referred to as a Special Study 699, or Independent Study. 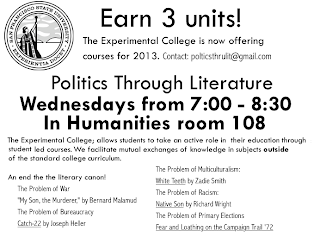 Essentially, the Experimental College is a coordinated group of students that decide to take an Independent Study class together. Not that complicated, right? If you do get approval and sponsorship from the chair of a department (the Chairs of departments will save you extra steps if they decide to support the project) then you understand that you must fulfill obligations for following through with grades at the end of the semester and any additional paperwork. Speaking of grades, figure out a grading system for class. Maybe you don’t believe in grades, but if you’re creating an official class students can register for departments sign off on then you must expect to determine how to make your class function within the school bureaucracy. Often times, grades are an important component of this legitimization of the class you create and can incentivize students to take it more seriously since they can strategically benefit from the experience. The grading system we chose for our class was peer review based on participation and the creation of a collective ‘zine in which we turned in all the final work to the chair, along with our reflection papers. Find a location for your class. This can be outside, in the quad, a café, Lake Merced etc. A simple classroom worked well for us because we got access to the audio visual equipment and chalk board. The setting can really be important for a successful class. The important thing is that you have a consistent meeting space that is accessible where you can meet throughout the semester. We walked around during the first two weeks of school until we found a class that we knew was empty and liberated this class all semester long. You can do the same. with the amount of attention and support we've gained from last semesters actions we have a chance to gain ground in redefining education and possibly give new directions for students after college. bring whatever ideas you've got as well as any info you'd like you share. what course would you facilitate? what study group do you want to form? what project do you want to collaborate on? I would suggest taking a look at http://www.edu-factory.org/wp/ for inspiration.